"How old is this razor?" It can be difficult to figure out. Sometimes patent dates are a help, but they give you the front end of the date scale, and not always too exactly. Some razor makers put serial numbers on their razors, but we don't always have the key to how the serial numbers fit to dates of manufacture. Gillette is one manufacturer for whom we have information on serial numbers and later date of manufacture codes that we can link to time. Other makers included serial or manufacturing codes, but we do not have the keys. AutoStrop and Rolls are two well known manufacturers who serial numbered their razors. 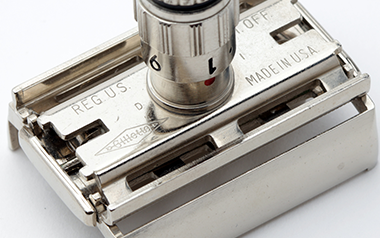 If you have the key to another manufacturer's codes, please share this information with other collectors. 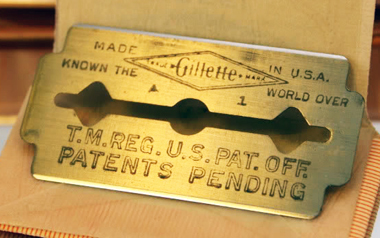 Razor Serial Numbers were impressed on all Gillette razors from 1904 until 1921, and on deluxe models from 1921 until 1931 (except for a period in 1927-28). This corresponds to the time King Gillette was directly associated with the business, and may have been at his insistence. These serial numbers were on the top of the guard, or sometimes the inner barrel. 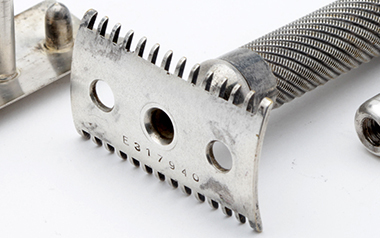 There were no razor serial numbers from 1931 until 1951. Gillette Date Codes were used from January 1951 until 2001. They are found in the top left and right corners on the underside of razor guards, both 3 peice and 1 piece models. The letter represents the year, found on the chart below, and the number 1-4 correspond with the quarter of the year. Please Contact Us with any corrections or updates. 1903 No Serial No.s 100* OLD TYPE "Double Ring" handle thin cap/guard Blades notched for "heat lots". "Gillette Safety Razor Company" twined around all 3 holes. 1906 370425-770424 100*/102 King Gillette's picture on blade wrappers. 1908 A195425-A675857 102 "Diamond & Arrow" Logo. Pocket Edition with solid fancy handles & matching cases. "Diamond and Arrow" logo introduced (1-1/8" wide). Steel lot# only on blade. back to top B222221-B697600 102 Aristocrat Model introduced. J Series all U.S. military 102 Big Fellow introduced. back to top K927217-N459887 102 Diamond and Arrow reduced to 7/8" wide. 1928 Serial No.s start Aug. 28 1C-94800C 102A/106/126 126= Mod. 106 /narrow shoulders Last year for 3-hole blades. 1929 94801C-241755C 102A/126/134 Model 134 "long slot" test marketed "New" Gillette Long slot blade (no serial #). 134 NEW 134: New Gillette (takes slotted blade) "De Luxe" Kroman stainless steel blade introduced/ discont'd. Year letter/ number code introduced. Handles: ball end and new bar end. Blue blade (plain slot and diamonds) introduced. 1933 D 134/160 "New" blade discontinued. (TTO=Twist To Open ) GEN. 1 TTO Aristocrat One-Piece TTO with Bulldog handle & comb guard. Thin blade introduced in Red/ Black wrapper. 1939 J 134/TTO/Tech TECH Tech intro'd with triangle guard slots. 1944 O Tech War production only Camoflage blade for military use. 1946 R TTO/Tech Full civilian production resumes. Thin Blade black and white wrapper red print. "SuperSpeed" replaces Senator. "Rocket" in Canada and UK. 1949 U TTO/Tech First plastic case: red/ clear styrene. 1954 Z TTO/Tech Colored TTO knobs for blade angle. 1958 D ADJUST/TTO/Tech "Adjustable" Dial TTO. TV Special this year only. Limited nickle toggle run. Super Blue Blade (silicone coated). back to top F-O ADJUST/TTO/Tech Toggle Adjustable produced. 1963 I ADJUST/TTO/Tech Lady Gillette TTO. Men's Adjustable gets long thin handle. Stainless Steel Blade. "Techmatic" Band Blade Razor Super Stainless Steel Blade. Techmatic Band Cartridges. 1968 N TTO/Knack/Tech/Techmatic Knack (SlimTwist in UK & Canada) knob under head. "Orbiter 4000" electric Band razor Plus DE Blade. Super Stainless Injector Blade. back to top P-Z TTO/Knack/Tech Platinum-Plus DE Blade. Last year for Blue Blade? 1972 S TTO/DE/Tech/TracII Knack becomes "Double Edge" (DE)? 1973 T TTO/DE/Tech/TracII TracII introduced as "GII" outside North America. Tech prod'n ends in US. "Twinjector" twinned injector blades. 1976 W DE/TracII/Dispo "Good News" disposible for men. 1985 F DE/TracII/Atra/Dispo Trac II and Atra "Plus"
back to top K-U DE/TracII/Atra/Dispo/Sensor "Sensor" for Men introduced in 1990 Sensor pivoting cartridge, with flexible twin blades. Mach3 "Mach3" for Men introduced. DE production ends. Mach3 triple blade cartridge. Mach3 DE Blades still available. Mach3 Venus for Women, Mach3 style razor. Mach3 "Cool Blue" Venus for Women triple blade cartridge. Much of the information on this page has been extracted from the excellent books: "Safety Razor Reference Guide" by Robert K. Waits, and "The Complete Gillette Collector's Handbook" and Collector's Guide to American Razor Blades" by Phillip L. Krumholz. My thanks to both authors!